A Food Blog It Is! I'm am so excited to finally announce the project I have been working on over the last couple of months. With a lot of back and forth on whether or not to undertake this, I finally decided a second blog was the exact component I wanted as a forum to share recipes. An additional place affiliated with Hill Collection, sporting the same flair and style, but nonetheless a place all its own. As a lover of cooking and baking, this new blog only seemed fitting. It has been a labor of love and one I'm so thrilled to be sharing! Let me introduce Flour Darling to you! If you've been visiting Hill Collection for a while, you know that I share recipes on here. Recently I have had so many recipes that I have been dying to share, however, I didn't feel that this space was right for all those delicious dishes. Flour Darling was born from that and will host all of my recipes from here on out. Browse around the new blog, clicking the tabs to discover what will be offered. Of course, check out the first recipe too! It's a Hill favorite! My favorite aspect is the Recipe Box tab, which features thumbnails of all the possible food categories. Clicking on a thumbnail will take you to a list of corresponding recipes under that category. 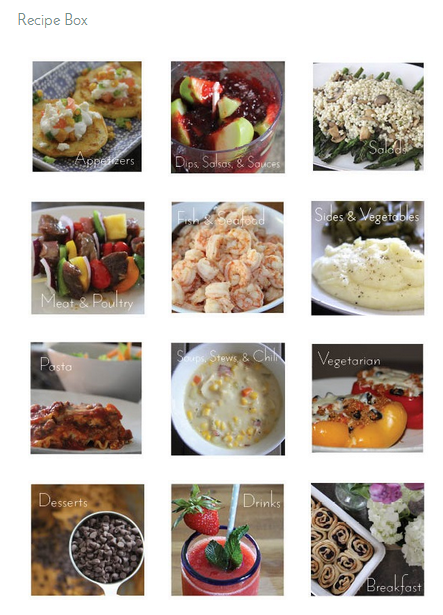 As the blog grows so will these thumbnails and recipes. Eventually there will be a tab for food themes throughout the year, highlighting the best recipes for the seasons, holidays, and other special occasions. The recipes that are currently organized on Hill Collection will eventually make their way over to the new food blog. And in the recipe tab's place, a link to Flour Darling will appear. Both blogs will allow easy links to jump back and forth between these lifestyle and food blogs of mine. I can't quite find the right words to express my delight in this new blog! I have many hopes for it and look forward to it growing! I am so appreciative of the love and support you show Hill Collection, and I can only imagine the same for Flour Darling! I'll still be writing at Hill Collection every Monday through Friday, sharing the adventures, home projects, DIY's, and such. The recipes, will just be a click away at Flour Darling. So here's to a new blogging adventure! P.S. Don't forget to enter the GIVEAWAY!! It ends tomorrow night at midnight! !